Smooth Sailing: Whats Twitter, whats all the fuss about and should I be using it? 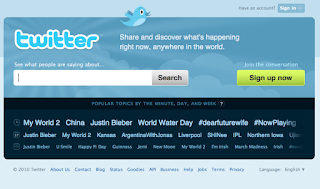 Whats Twitter, whats all the fuss about and should I be using it? Twitter gives a voice to even the weakest signal. It can help you make better choices and gives you a platform where you can influence whats happening in the world. Twitter is a social networking and micro-blogging service that allows you to send short messages, 140 characters in length, that answer the question “What’s happening now?” or "Whats got my attention?". The messages, called “tweets”, can be read by your friends or “followers”. It could be breaking news, a great deal at your favourite shop, a local traffic jam (hands free of course) or simply a friendly hello. You can access Twitter through the internet, on your smart phone or via SMS on a simple mobile phone. Twitters growth has come from older adults who might not have used social network sites before, the NewYorkTimes reported. You might like to think about the implications for your organisation as more and more of your customers join Twitter. * Gather more feedback - Imagine people are having a great experience using your widget, wouldn't you want to know? Are people Twittering about your business and what are they saying? Do you know what people are saying about you right now on Twitter and don't you want to be part of the conversation - I would! Heres how to listen in and you don't even need a Twitter account. Listening in means starting with searching for you business name. You can use the Twitter search at search.twitter.com or Googles Twitter search - we have embedded this on our website at www.spiral.co.nz/twitter - to make it easy for you to find. If the buzz is good ... great, you have testimonilas you can use. If the buzz is critical ..., great, you can do something about it. If you want to be part of the conversation you will need to get a Twitter account and start tweeting. If you want to influence whats being said about you, you will need to get tweeting. Search Twitter now to hear whats being said, right now, about your company, product or brand.